Despite this, people who deny the basic facts of climate change have tried to argue that the Earth is either not warming or is only slowly heating. Well that just isn’t true any more. The last three years are the nail in the coffin of the deniers of climate change. We have enough data this year to call 2016 the hottest year ever – and we have three months left. In the public sphere, the claim that global warming has “stopped” has long been a contrarian talking point. After being confined to the media and internet blogs for some time, this contrarian framing eventually found entry into the scientific literature, which is now replete with articles that address a presumed recent “pause” or “hiatus” in global warming. The “hiatus” also featured as an accepted fact in the latest assessment report of the IPCC. Despite its widespread acceptance in the scientific community, there are reasons to be skeptical of the existence of the “hiatus”. Which is quite clever, don’t you think? So the scientists wrote hundreds of papers analysing the great global temperature hiatus, not from their better judgement and interest in the subject, but because it was a “contrarian talking point.” So much for the independence and judgement of professional scientists, not to mention the foremost climate science organisation in the world, the IPCC. Forced into it, they were. So Lewandowsky et al. are at odds with the orthodox scientific view, but nevertheless refer to those differing from them as themselves “contrarians”. Filthy contrarians — not like us. Lewandowsky et al. hint at errors in “the global surface temperature record,” suggesting that artifacts, when corrected, give “little evidence for a ‘hiatus’.” Somebody might like to follow that one up, I’m out of time. Admit you don’t understand what’s causing the warming. In a vast, dynamic system containing numerous interlinked causes of warming, don’t investigate any of them, just pick the one you want. Announce dramatically (like King Canute) that you can actually fight the climate substantially and noticeably: you just have to reduce your emissions (which nobody had heard of) at an extremely high cost. Demand study grants to help you understand this new-fangled cause of warming which you’re certain will ruin the planet. The recent warming has been moderate and well within natural variation. It warmed faster than this in the late 19th century. Nothing to worry about. The warming record over the last three years is far too short to give cause for concern unless you’re a proper worry-wart. You might have noticed we’ve just had the largest El Nino ever recorded. It is unconnected with anthropogenic global warming, but it makes the global temperature go up! But the temperature has already gone right back down again, and it’s back where it was in late 2015. Note too, that each year has been a “record” by an insignificant few hundredths of a degree, which is no different from zero. So, scientifically, recent “record” years have been the same. But still the alarmists cry “record”. Unscientific bozos. So there’s a new paper on ocean heat content (Observed and simulated full-depth ocean heat-content changes for 1970–2005, by Cheng et al., including Trenberth (wow) and Abraham). They invent a new method of “observing” ocean heat content through the entire depth of the ocean. To do that they reanalyse bathythermograph records and spread sparse readings across more than four thousand kilometres of ocean. Genius. To check their new work they compare it with – ta-daa – climate model simulations. They find good agreement and suggest that past work underestimates ocean heat uptake. What a surprise. The reasons why the models have large divergence are still an actively studied issue. Well, it’s good they’re studying it. 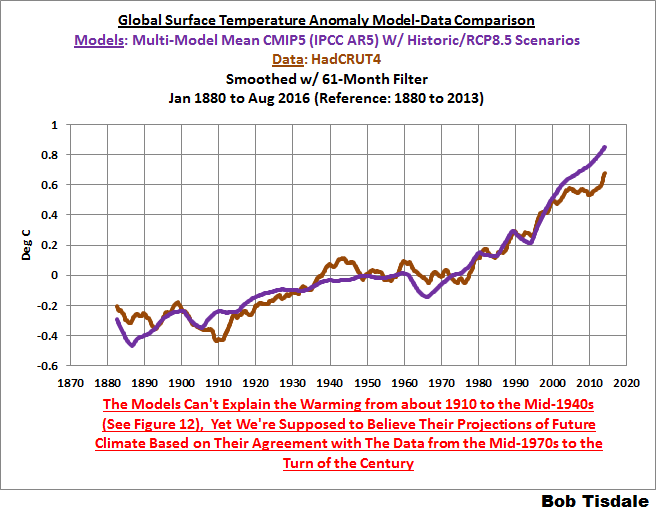 It could be that the models don’t match reality and, according to the AR5, most run too hot. If there was a single accurate and skilled climate model everyone would be using it – who would use the incorrect ones? If they run them all, they can’t have identified the correct one, can they? But they run them all, tell us the average is the truth and extort fortunes from the world’s taxpayers to mitigate the coming disaster. I hope I’ve shown a few good reasons to question the climate models and be sceptical of the ever-worsening climate “forecasts” and the rising tempo of alarm. Only a few — there are many more. Not saying it’s wrong, guvnor, just asking questions that occurred to me about what you said. The warmies cannot know the heat content of the ocean because we’re not taking enough readings, therefore I cannot accept it when they tell us we’ve been dangerously warming the ocean and the damn warming is going to get damn dangerous when my grandchildren have become damn grandparents! I think that’s damn reasonable thinking, and to be constantly called a damn denier gets my damn dander up! I speak for millions when I say this: I don’t deny climate change, I don’t deny global warming and I don’t even deny anthropogenic global warming. However, I deny dangerous anthropogenic global warming (it’s a matter of magnitude). 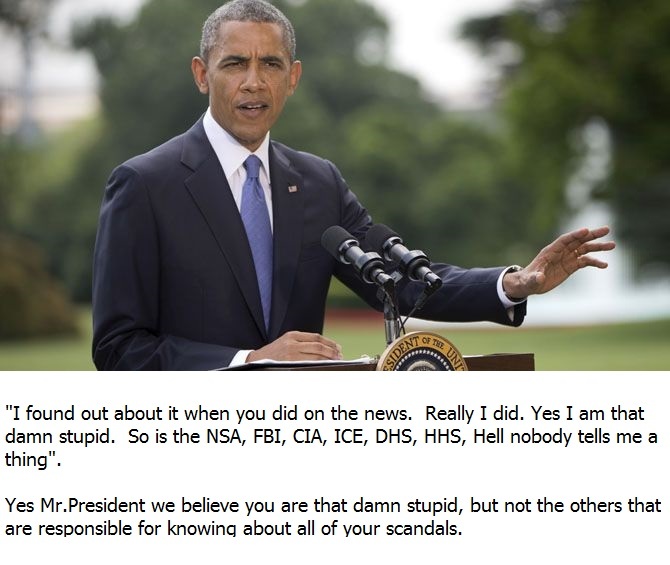 My reasons for denying it are entirely plausible—what you might call plausible deniability. You’ve been told by others: you don’t know any climate science. Gavin Schmidt can waffle on as much as he likes, and you can hero worship him with wonder eyed devotion like a teeny-bopper at a Justin Bieber concert, but it still doesn’t change the fact that half of the predicted warming in the form of positive feedback from water vapour is missing (as confirmed by the empirical data from multiple sources in the IPCC AR5), or that the climate models are falsified by the empirical temperature data from multiple sources. No we are not. Dennis N Horne has claimed that we are morons and mentally ill.
Herr Thomas is an intelligent person who thinks that climate change is a “wired and wicket” problem. I’m starting to think you’re right. I’ll check out your echo chamber piece. On September 20, 2016, 376 members of the National Academy of Sciences, including 30 Nobel laureates, published an open letter to draw attention to the serious risks of climate change. I note Steven Weinberg signed. Well, that’s the theory anyway. But the “forcing” has had no effect whatsoever on the earth’s energy balance, which is the IPCC’s primary climate change criteria. By the scientific method therefore, the theory is falsified. Can you explain to me why the stratosphere is cooling with more CO2. Thanks. What theory is that? Quote/cite your “theory”/hypothesis from a reputable source please Simon e.g. the IPCC. It’s certainly not the IPCC’s radiative forcing theory which has the rapidly increasing GHG radiative forcing far greater than actual energy imbalance at TOA which is NOT increasing. And what happens when CO2-forced model temperature results are compared to actual surface temperature with ENSO smoothing? That would easily pull the ENSO-smoothed trendline in HadCRUT4 back down flat and out of the model envelope. FAQ 2.1, Box 1: What is Radiative Forcing? For Warmies, everything is a human fingerprint on the climate system. By scientifically fraudulent attribution, yes of course. Just not this century though. Is anthropogenic sea level fingerprint already detectable in the Pacific Ocean? In short, no, “”Our fingerprints” “are [NOT} identifiable in [Pacific] sea level rise” or in the rest of the world’s seas. Turns out 376 members of the National Academy of Sciences, including 30 Nobel laureates, are group-thinking dupes who haven’t looked at the metrics or literature. probably ideologically driven too. Off topic but the Project Veritas work is worth looking at, with respect to the voter fraud and other activities within the DNC. Lying, cheating fraudsters, and all supported by the media of course. Given the lying and fraud within the political class, why should we have any trust in scientists who are paid by these same lying cheating fraudsters? This is REALLY important because………? We have the evidence Simon. The evidence is the IPCC’s AR5 report. They have no physical evidence whatsoever for their anthro ocean warming attribution in Chapter 10 where they only “expect” “air-sea fluxes” to be the anthro mechanism. They found no physical evidence of those “expected” “air-sea fluxes” in Chapter 3 but they attribute ocean warming to human cause anyway. Their attribution is merely an ASSUMPTION based on the circular reasoning of climate model simulations i.e. miss-representation of results, by definition – scientific fraud. Note that most of their theoretical heat just dissipated to space as OLR i.e. it was never “retained”. What’s left “retained”? Negligible atmospheric heat and a whole lot of ocean heat. The only net flux into the surface is solar. Solar energy is therefore the only surface heating agent, particularly the ocean. To attribute otherwise, as the IPCC does, is scientifically fraudulent. Note the part where it says ‘Smoothing Radius: 1200km’, and note all the red warming in the Arctic and Antarctica. Now, change the smoothing radius to 250km. Note that all the red warming in the Arctic and Antarctica has disappeared and is replaced by grey. Do you know why? It’s because there are no temperature readings in these regions so NASA have applied temperatures FROM UP TO 1200km AWAY! Now, do you think you can predict the temperatures in Timaru from those in Auckland, or the Gold Coast from Cairns? No? Same applies to NASA’s GISS temperature record. Which leads to the following question – if the surface temperature datasets are less accurate than the satellites (which cover the entire globe), why do alarmists like Tamino insist on using the less accurate surface datasets? Answer – because satellite daatsets show how little the Earth has warmed. Looks like Tamino shot himself in the foot with his own argument there Simon. The IPCC shows the satellite records as more accurate too, would you like me to post the error margins from the various datasets for you to see? And why don’t they talk about the GISTEMP zonal breakdown? Even GISS does that and very good presentation too but never a Schmidt mention. Houston. we have a problem with our “global warming” ……..
You do not need regular cross-gridded data points if you are attempting to infer a global temperature anomaly. There are strong cross-correlations between sites on monthly and annual time periods. Satellites also do a poor job at sampling the polar regions. If the fraud really exists, how on earth do they ensure that 97% of climate scientists do not break ranks and spoil the ‘plot’? Why don’t you write a paper and earn a Nobel Prize for a new paradigm? Is it because the journal referees are in on the plot also? Is this all tied in with Andy’s media / politics / voting conspiracy? Wrong ocean dataset in that last comment link. Works out to 0.053C/decade “warming” for Lat 37S Sept 2001 – Sept 2016 (0.08 total) using the ocean dataset with the most warming “adjusted” in and plenty of fictitious data as Magoo points out. These anomalies jump around depending on ocean dataset and “smoothing”. But obviously negligible change for 37S whatever you use. Why would I want to “infer” that? What are you on about Simon? A “global temperature anomaly” does NOT exist anywhere on earth i.e it is not a real thing; it is an imaginary construct. Even a zonal mean is an imaginary construct. Every longitude on a particular latitude will not return the zonal mean for that latitude. The problem all you Warmies have is that once the fictitious notion of a “global” anomaly is thrown out (as it should be), the whole human caused “global warming” idea falls apart. There’s nothing “consistent” across the latitudes. Look at the huge differences in the September 2016 Zonal Mean just for example. This is why there is NEVER Warmy analyses of Zonal Means. I’ve laid out my case for scientific fraud by the IPCC upthreadf. Prove me wrong Simon i.e. put up or shut up. Because I know a bit about Weinberg and I trust his judgement, whereas I think you are insane. Magoon is an ignorant fool and Andy is a halfwit. I take it you can’t explain why more CO2 cools the stratosphere while more CO2 warms the troposphere. What a surprise. But what do I know, as a half-witted moron? Thanks goodness for polite and engaging people like Dennis to keep us on our toes! So what if I can or can’t. In respect to stratospheric cooling, speculation on your part Dennis. Correlation is not necessarily causation. And has nothing to do with the IPCC’s primary climate change criteria (see upthread) anyway. In respect to “CO2 warms the troposphere”. What warming? i.e. what warming commensurate with theoretical CO2 forcing at TOA this century? Theoretical CO2 forcing (1.9 W.m-2 @ 400ppm) is having no effect whatsoever on the TOA energy imbalance so obviously CO2 is NOT controlling tropospheric temperature at ANY level – upper, mid, near-surface, or surface. A paper published today in the Journal of Climate uses “a chemistry-climate model coupled to an ocean model” to arrive at a number of seeming contradictory conclusions about the opposing radiative effects of the greenhouse gases CO2, water vapor, ozone, and halocarbons (CFCs) depending upon the levels in the atmosphere where each of these are present. Conventional AGW theory proposes the existence of a mid-troposphere “hot spot” and an overlying cooling of the stratosphere because heat is “trapped” in the “hot spot” and therefore can’t make it to the stratosphere. However, despite millions of weather balloon and satellite observations over the past 60 years, the “hot spot” has still not been found and thus questions the fundamental theory of anthropogenic global warming climate change. The formation of a “hot spot” would also require a physically impossible reduction of entropy in the mid-troposphere and thus violate the second law of thermodynamics which requires maximum entropy production. I’ve been asking CAGW believers for years why CO2 and other greenhouse gases have opposite radiative effects upon global temperatures depending upon where they happen to be located in the atmosphere, and have yet to receive a satisfactory answer. Even the warmists themselves can’t seem to agree on this fundamental question underlying CAGW theory. Wikipedia propagandist William Connolley disagrees with Gavin Schmidt and RealClimate on why increased greenhouse gases would cause the stratosphere to cool. A team of researchers from Virginia Tech have predicted that water availability in the Blue Nile Basin of Ethiopia may increase in coming decades due to global climate change. It could also lead to increased crop production, spur massive hydroelectric power projects, and foster irrigation development in the region. When he qualifies he wants “MD” added to his name on the back of his player shirt. Interesting. Hope the best man wins. Separating out the impacts of internal variability on evaluations of TCR. In a blogpost from May 2016 I did some simple investigations about the Transient Climate Response (TCR) as it’s observed. The starting point was the record of Cowtan/Way (C/W) and the Forcings due to greenhouse gases (GHG), land use and so on as they were described in IPCC AR5 . The result was a TCR for this record very near the TCR as it was determined by Nicholas Lewis from the HadCRUT4 record. A few days ago Tamino (aka Grant Foster) released a blogpost with all the data (thank you for this, Tamino) in which he introduced a “sophisticated adjustment” to eliminate the influences of ENSO, solar TSI- changes and volcanic activities on the temperatures from 1951 to the present ( 8/2016) in many records. While there are several criticisms that can be made about this procedure, e.g. ENSO could be a part of the signal and not noise to eliminate, nevertheless I followed the method of Tamino. I was interested in using the records for the global mean surface temperatures (GMST) to recalculate the TCR as it was observed from 1951 to 2015 with annual data. Fig. 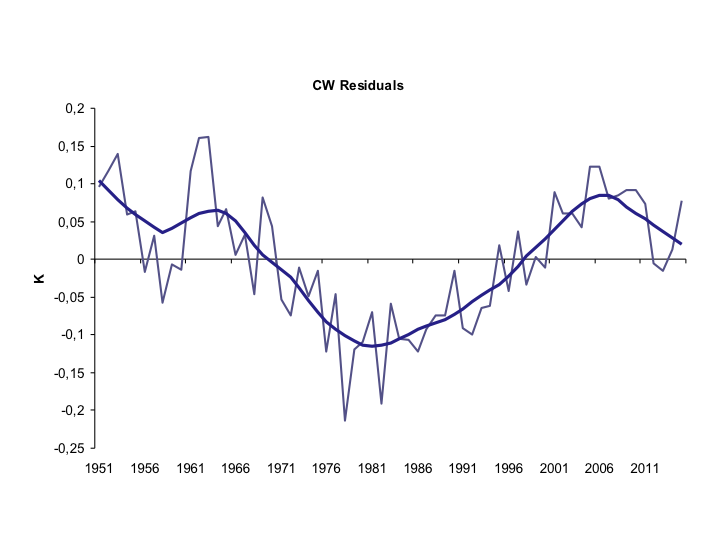 4: The residuals of the adjusted C/W series, which is the temperature variability not explained by the evolution of forcing with a 15 year smooth (Loess). Fig. 5: The residuals for the unadjusted C/W series. The big (but short) ticks for volcanoes and ENSO ( see 1992/1993, 1997/1998) are not visible in fig. 4, however the long term pattern is not influenced by much. The smoothed time series shows the same picture. Also after removing the volcanic and ENSO events, the internal variability remains almost the same. In the May blogpost I compared this pattern with the AMO (see Fig. 5 there) and the similarity seems to stand. The uptick between 1990 and 2005 is also clearly visible in the ENSO- adjusted series of Tamino. Therefore this low frequency internal variability has nothing to do with ENSO; it seems to be a result of the AMO. Fig. 6: The smoothed (15 years Loess) residuals of the linear regression of the GMST anomalies of the adjusted records versus the forcings. The pattern is very stable in all records. The exception here is GISS. During 1970– 1995, the internal variability is dampened. A possible reason for this could be the ERSSTv4 adjustment during this period due to the change of the measurement methods (Karl et al. 2015); see also Fig. 1. # The estimated TCR of ~ 1.35 (see Nicholas Lewis) is confirmed by the adjusted temperatures of the recent blogpost by Tamino. He stresses the physical importance of his statistical operation with the evaluation of his model. 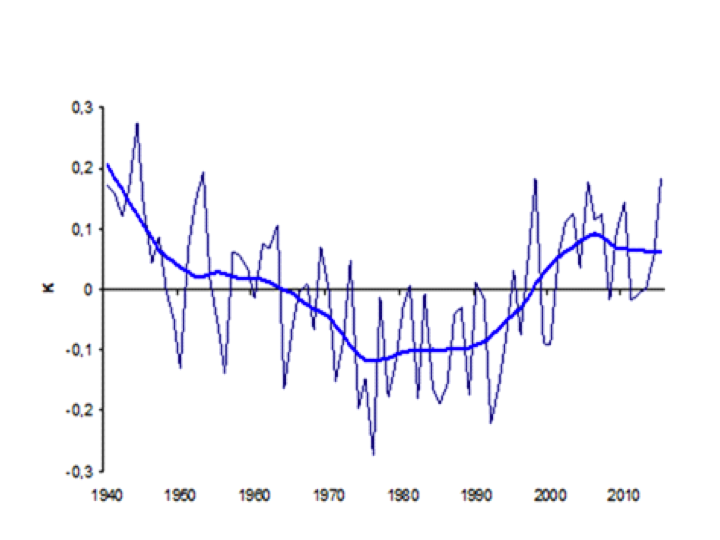 # In contrast to the statement of Tamino that “there is a steady warming since 1976” with almost no variability, there is a decadal up and down in the adjusted time series very similar to the AMO-pattern with an amplitude of round about 0.2K . # The TCR estimate from observations of ~1.35 is supported by at least 3 independent records: CRU, C/W and Berkeley with a deviation of only around 6%. The reason for the upward divergence of the GISS series associated with a suppressed internal variability can only be guessed. A closer investigation of this divergence is beyond the scope of this blogpost. This is the Multidecadal Variability signal (MDV). Tamino is oblivious of it. This MDV signal MUST ALSO be removed BEFORE comparing to the CO2-driven climate model mean (which Tamino does NOT do). Obviously the residual after MDV removal will be nothing like the CO2-driven model mean – way too cool. Not so. Confirmed ONLY IF after the next 14 years of the 15 year negative phase of MDV (neutral circa 2015) the MDV signal turns up again, the secular trend (ST) is continuing UP in linear fashion as per Tamino and Bosse. This will be AFTER 2030. There is no guarantee whatsoever that this will transpire. The solar conjecture is in respect to the secular trend (ST) and given the solar recession underway there is remote possibility of a continuing quasi-linear secular trend (ST) by 2030 (which obviously isn’t actually linear since 1951). 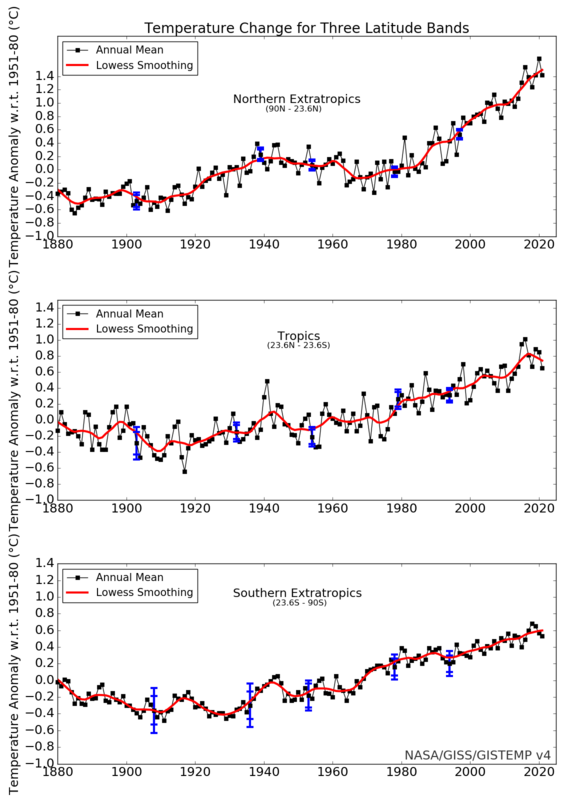 SSA analysis of the secular trend (ST) does NOT return a linear trend (done before the latest El Nino). The ST was already exhibiting a negative inflexion i.e. indicating the ST will top out in the 2020s. Now there’s been a strong El Nino we will have to wait years to see where the ST is going. And these Tamino/Bosse analyses only begin at 1951. Was there no life on Earth prior to 1951? By Tamino’s standard of sophistication that is. Which he only applies post 1951. Leaves him completely oblivious to the MDV signal and he still hasn’t extracted the actual long-term ST signal even after his experience with Foster & Rahmstorf (2011) which the IPCC cites in Chapter 10 Detection and Attribution. So much for self-assessment, and IPCC assessment. I should point out (Ad nauseam) that Tamino/Bosse, and any other GMST analyses, are effectively just dissecting Northern Hemisphere signals (Tamino about 10 years behind in his level of “sophistication”). Those NH signals are only similar to the SH post 1974 but then not in magnitude. The scientists discovered that most climate models are unable to satisfactorily simulate the considerable differences between the hemispheres. The models appear to underestimate the influence of internal variability, in comparison with external forcings like solar irradiation, volcanic eruptions or human greenhouse gas emissions. “Regional differences in the climatic evolution of the next decades could therefore be larger than the current models predict,” says Neukom. [Disclosure: I’ve been sucked in by ‘The GMST Illusion’ myself in the past – not any more]. Since the two presentations [Raw vs Smoothed] have their advantages, I will present the graphs in raw and smoothed forms. So not to overwhelm the post with a bunch of graphs, I’ve uploaded them and provided links to them in table form, allowing you to select which regions you wish to view and in which format. See Table 2. Use Table 1 and the map in Figure 3 as references. Happy viewing. In last week’s post on the Horrors of Homogenization I presented examples of the large distortions caused by the adjustments applied by NOAA/NCDC to individual raw surface air temperature records. In this follow-up post I analyze the equally large distortions that similar adjustments applied by GISS introduce at the hemispheric and global scale. The analysis is performed by comparing the adjusted GISS series with unadjusted series I constructed from scratch some years ago using the same set of raw records as GISS and procedures which I describe briefly below. Record selection: Over a period of months I went through thousands of GISTEMP raw records one by one, selecting those which I could verify by comparison with adjacent records and throwing out those that didn’t fit. At the end of this process I had selected 800 raw records, about 500 in the Northern Hemisphere and 300 in the Southern Hemisphere. Projection distance: I found that there was no one-size fits-all answer, so I segregated the records into areas in which temperature trends were similar but different to the trends in adjoining areas, ultimately blocking out 64 areas ranging in size from a few hundred thousand to several million square miles. Averaging: I then averaged the records in each area and area-weighted the averages to construct global and hemispheric temperature time series. The peaks and troughs match up well but GISS shows about 0.3C more overall warming, which as illustrated by the GISS-minus-RA difference plot is added quite regularly. Since both GISS and I used the same raw data set we can reasonably assume that this added warming was a product of the GISS homogeneity adjustments. The question now becomes, is the added warming real or was it manufactured by the GISS homogenization algorithm? Comparing the hemispheric series gives the answer. How did GISS achieve this result? As Euan pointed out to me in correspondence: “it should be obvious that the S hemisphere has been homogenised to match a nearby set of stations – the N hemisphere.” And if one starts in an area of the N. Hemisphere that shows significant warming, homogenizes the surrounding raw records with it, and then moves progressively south homogenizing raw records with the already-homogenized records to the north it’s possible to see how something like this could happen. Confirming that it did happen, however, would take a lot of work. New Zealand stations have been among those SH stations massively “adjusted” by GISS to conform to their preconceived profile which is really just the NH profile. The climate models are tuned to GMST but GMST is effectively just Northern Hemisphere, hence the VERY “good match” in the NH. But the whole charade falls apart in ‘The inconvenient Southern Hemisphere’, as Judith Curry puts it. But GISS has manufactured a SH warming rate identical to the NH in this Met Stn analysis. “Oh! What a tangled web we weave, when first we practice to deceive” – “Marmion” by Sir Walter Scott. RT, originally Russia Today, is a television network funded by the Russian government. It operates cable and satellite television channels directed to audiences outside of Russia as well as providing. RT is the first Russian 24/7 English-language news channel which brings the Russian view on global news. Bildt is a controversial figure having sat on the board of Lundin Oil – an organization which was investigated for alleged human rights abuses in Sudan in the late ’90s and early 2000s. Two Swedish investigative journalists were imprisoned for terrorist-related offenses while looking into Lundin’s business dealings in Ethiopia in December 2011. He was also a major supporter of the Maidan movement which eventually toppled the democratically-elected government of President Viktor Yanukovich in Ukraine and has caused continued unrest in the east of the country. Having worked as an EU High Representative for Bosnia in the ’90s, Bildt was one of three people nominated by controversial tycoon George Soros, in an email to Clinton, to be a senior EU mediator in Albania during a period of civil unrest in 2011. Clinton’s press secretary Brian Fallon made similar claims on Twitter while the campaign’s director of communications, Jennifer Palmieri, accused RT of collusion during a TV interview. The reality was simply that RT journalists were monitoring the WikiLeaks website and reacted quickest to break the story when the emails were uploaded. Unrelated to anything except E&E Legal (think E&E Legal vs Schneiderman, Mann) re their involvement in the Roundup controversy. The agency [IARC – WHO] defended its methods as scientifically sound and “widely respected for their scientific rigor, standardized and transparent process and…freedom from conflicts of interest.” Numerous freedom of information requests by the Energy & Environment Legal Institute (E&E Legal), a US conservative advocacy group, have since been turned down with this reasoning. Two people on the UN panel that just ruled the herbicide glyphosate “unlikely” to cause cancer in humans have ties to groups that have accepted over $1 million from Monsanto and another industry group representing agrochemical giants. The people in question are Professor Alan Boobis [ISLI], chairman of the UN panel investigating glyphosate – the active ingredient in Monsanto’s herbicide Roundup and other similar products – and Professor Angelo Moretto [ISLI], the panel’s co-chair, the Guardian reported. Revelations of industry ties have drawn strong criticism from many environmental and anti-genetically modified organism (GMO) groups, who have said the connections between the UN panel and ISLI place the entire study into doubt. The non-governmental environmental organization Greenpeace also questioned the UN panel ruling in a statement, saying ISLI and its Health and Environmental gets most of its funding from private companies, including glyphosate producers. Although, given the UN’s track record, “conflicts of interest” is just normal UN operating practice i.e. no conflict at all from their point of view. Ironic that in this case E&E Legal and Greenpeace are on the same side. Lots of stuff here today to process.. The Southern Hemisphere temperature records are of interest. Probably worth having a link to Euan Mearn’s take on the topic. Both Roger and Euan replicated UAH Southern Hemisphere from surface data, Roger a little better than Euan. I think this speaks volumes for starters. Puerto Casado and Gisborne Aero are both stations in Euan’ series. Paul Homewood did a case study of Puerto Casado and I’ve been interested in Gisborne Aero. There are inexplicable adjustments to each by GISS, NCDC, and BEST. Those 2 are typical of just about all of the SH and plenty in the NH too (e.g. Iceland). 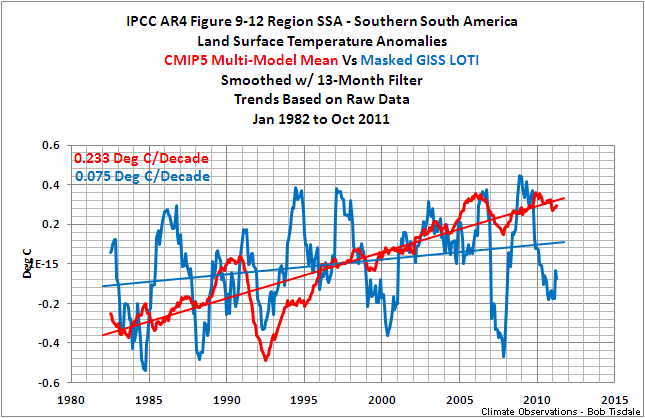 Now contrast our results with the SH air temperature series published by GISS, NOAA/NCDC, CRU and BEST (below). They all show more warming than Euan and me. Why? Because they apply spurious warming “adjustments”; there’s no other way they can do it. And not only that, they can’t even agree on how large the adjustments should be (NOAA shows almost twice as much warming as GISS). Which brings up another problem. Which of these august scientific institutions is right? Do we even have a reliable published SH surface air temperature series? If we don’t we don’t have a reliable global one either. I have tortured the data for the 174 stations I selected every which way I know and cannot squeeze more than +0.18˚C per century out of them. It has taken more than data torture to achieve the spurious results – there’s been in-built “expectation” (confirmation bias). In comments Roger gives his idea of how BEST has “a temperature expectation of 0.9C of warming” built in by algorithm. And easy to see from GISS adjustment to Gisborne Aero how they achieve their results. “Paul Homewood did [case studies] of Puerto Casado [and Gisborne Aero] and I’ve been interested in Gisborne Aero. Even WITH all the manufactured warming in the SH observational data, there’s still a massive discrepancy between CO2-forced models and (adjusted) observations. “The oceans really provide us with the most reliable indicator of how the globe as a whole is warming,” said Steve Rintoul, interim director of the Climate Science Centre at the CSIRO. Peter Hannam dutifully reports. Journalism is collectively brain-dead on this. “They claimed they were worried about me and a couple people had expressed concern about my mental health,” Rectenwald told The Post. Anyone heading to Canberra next week? The second link, however, is a wikileaks revelation that I find more difficult to fathom, given that Bernie Sanders was by far the best candidate on tackling climate change. Perhaps someone can offer an explanation. Upthread we have the whole Soros-Media Matters-Think Progress-Clinton-Podesta machine documented. Tony is asking at the wrong blog. Bet he’s equally clueless about Climategate. In Tarrant County, a woman casting a vote for the Republicans saw it flipped to Democrat. Here’s the link to Senator Malcolm Robert’s Press Conference with Tony Heller and Dr Tim Ball.